Email alexism@thepaintedturtle.org to be added to the wait list. Reserved tickets for 8 guests to wine and cheese event, dinner reservation to your choice of one of three participating restaurants (cost of dinner not included), one year of restaurant reservations at The Palisades Village, annual VIP Status at The Palisades Village, access to The Coast Lounge for personal shopping, private dining, and entertaining, and one family movie night experience, 16 raffle tickets and complimentary valet night of the event, recognition on all event materials. And your gift sends 4 children to summer camp at The Painted Turtle! Email alexism@thepaintedturtle.org to be added to the wait list. Reserved tickets for 6 guests to wine and cheese event, dinner reservation to your choice of one of three participating restaurants (cost of dinner not included), access to The Coast Lounge for personal shopping, private dining, and entertaining, and one family movie night experience, 12 raffle tickets and complimentary valet night of the event, recognition on all event materials. And your gift sends 2 children to summer camp at The Painted Turtle! Email alexism@thepaintedturtle.org to be added to the wait list. Reserved tickets for 4 guests to wine and cheese event, dinner reservation to your choice of one of three participating restaurants (cost of dinner not included), a gift card to a store at the Palisades Village, 8 raffle tickets and complimentary valet night of the event, recognition on all event materials. And your gift sends a child to summer camp at The Painted Turtle! Email alexism@thepaintedturtle.org to be added to the wait list. Reserved tickets for 2 guests to wine and cheese event, dinner reservation to your choice of one of three participating restaurants (cost of dinner not included), 4 raffle tickets and complimentary valet night of the event, recognition on all event materials. And your gift sends a child to family weekend session at The Painted Turtle! Email alexism@thepaintedturtle.org to be added to the wait list. One ticket to A Taste of the Village event which includes cocktails, hors d'oeuvres, and valet parking. If you'd like to make a donation, see below. I have read and agree to the Terms and Conditions and give my consent to The Painted Turtle to process my personal data. I understand I can revoke this consent at any time. Become a sponsor and receive special VIP benefits including a confirmed dinner reservation* at one of three participating restaurants at the Palisades Village. Following the program, dine at Blue Ribbon Sushi, Porto Via or The Draycott as 5% of dining tabs will be donated to The Painted Turtle the night of October 16th. *Dinner reservations are included with sponsorship levels of $1k+, however the dinner tab is the responsibility of the guest. Thank you for your support! 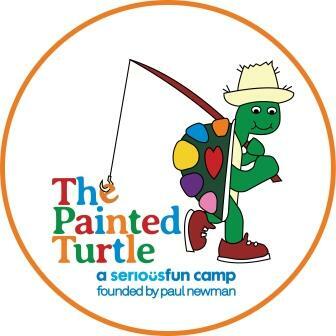 The Painted Turtle, co-founded by Paul Newman, is a year-round medical specialty camp in Lake Hughes, California, for children with serious illnesses. Through innovative and medically supported camp programs, The Painted Turtle helps children to reach beyond their illnesses to become their greater selves. Camp is a transformative experience that allows children to reclaim the joys of childhood. All children and families attend The Painted Turtle free of charge.